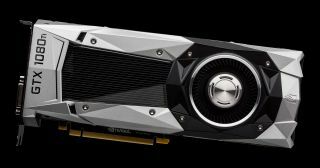 Many gamers are anxiously awaiting the arrival of Nvidia's GeForce GTX 1080 Ti graphics card, which is expected to bring near Titan X performance at lower than Titan X pricing. If the latest rumor turns out to be true, the wait will be over once CES 2017 rolls into view. There's been a bunch of online chatter in regards to the unannounced GTX 1080 Ti. Nvidia will have the final word, of course, but according to Chinese-language website Zol.com.cn, the GPU maker will formally launch the GTX 1080 Ti at CES in January (fist-bump to Fudzilla for the heads up). That means having to wait a little over three months, and perhaps a little longer if initial inventory is scarce. In the meantime, guesses as to the card's specs continue, with most having settled on the earlier rumor of Pascal GP102 GPU, with 26 SM clusters enabled and 3,328 CUDA cores (versus 28 SMs and 3,584 CUDA cores on the new Titan X), and 12GB of GDDR5 memory. You can read what our own predictions are here, but if we focus purely on the time frame for launching, CES 2017 is the most sensible spot to reveal the GTX 1080 Ti. AMD should have their Vega 10, and it would be five months after the Titan X launch. Last year Nvidia delayed talking about Pascal until GTC (their GPU Technology Conference), but GP102 is already a known quantity, and AMD certainly isn't going to plan a GPU launch around Nvidia's show. CES is neutral ground, and while it's focused on consumer electronics, there have been plenty of PC related announcements. Nvidia has been quiet on the GPU front the past few CES shows, instead focusing on their autonomous car solutions (Drive CX/PX/PX2, or if you prefer, Logan and Erista, with Parker and Xavier to come). We already know AI and self-driving cars will be part of the Nvidia keynote. Getting back to their roots and unveiling GTX 1080 Ti at CES would be a nice change of pace. Toss in a console design win with the Nintendo NX using an Nvidia SoC, and Jen-Hsun could go for the trifecta. As for the 1080 Ti launch date rumor from Zol, we can't comment on their trustworthiness as a source, but as Spock would have said, it's only logical.